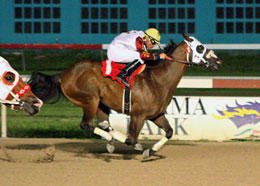 Wagon Empire, under jockey Rodrigo Vallejo, posts the top qualifying time for the Retama Park Derby(G3) on Saturday. SELMA, TX�JULY 14, 2012�Coming off a third place effort in the $50,000 TQHA Sires' Cup Derby on June 30, Wagon Empire scored his first win of the season while posting the top qualifying time for the Retama Park Derby(G3) on Saturday night. The ten fastest 3-year-olds from three trials contested on Saturday night will return to the Texas raceway on July 28th and vie for the winner's share of a $75,000-added purse gong 400 yards. Under jockey Rodrigo Vallejo, Wagon Empire made his first start for trainer Steven G. Keral. The Pyc Paint Your Wagon colt defeated Texasindependencegal by a nose in :19.550 seconds, a 111 speed index, for the top qualifying time. Owned by J.J. Racing, Wagon Empire has won three of 11 career starts while earning $36,495. Delores Hill bred him in Oklahoma from the First Down Dash mare Royalnative Empress. Texasindependencegal, also earned a 111 speed index, and held on for the second fastest time of :19.573. The Mr Ottyes filly is a homebred for Leonard J. Lyne. Cindi Keeton trains the filly out of the Strawflyin Buds mare Lovely Legs. Ridden by Luis Vivanco, the bay miss has won seven of 12 starts and earned more than $143,000. R.D. Hubbard's Lalia won the second trial in :19.659 seconds for the third fastest qualifying time. Trey Wood trains the Walk Thru Fire homebred out of the Mr Jess Perry mare Clays Knockout. Fourth in the Hobbs America Futurity(G2) last season, Lalia has earned $57,706. Ricky Ramirez rode her. For a complete list of Retama Park Derby finalists, times, sires, dams, owners, breeders and trainers CLICK HERE.